sandwich keyword: section begins with a begin-keyword (i.e. BEGIN_keyword) and ends with an end-keyword (i.e. END_keyword), where keyword is one among keywords. The comment-lines were introduced to the XSF file starting from XCrySDen version 1.4. The comment-lines start with the "#" character; comments are allowed only between sections and not within a given section. Here are two examples (correct and incorrect). First number stands for number of atoms in the primitive cell (2 in this case). The second number is always 1 for PRIMCOORD coordinates. 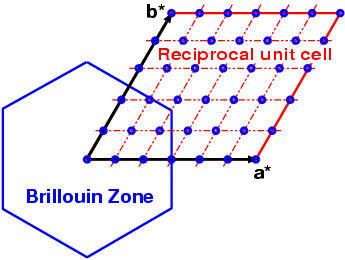 Specification of atoms in the primitive cell (the same as for ATOMS section). the AXSF file begins with the ANIMSTEPS nstep keyword, where nstep stands for number of animation steps. number of atoms for all steps must be the same !!! the ATOMS and PRIMCOORD keywords are prefixed by an integer number which is the sequential index of a given snapshot. Therefore the syntax is ATOMS istep and PRIMCOORD istep. for variable-cell crystal structure the PRIMVEC and CONVVEC keywords are prefixed with sequential index. Here is an example of AXSF file. It shows different structures during an optimization of water molecule. Note the index prefixes after ATOMS keywords. Here is an example of animated XSF for the ZnS crystal structure with the fixed unit-cell. Note the index prefixes after PRIMCOORD keywords. Here is an example of animated XSF for the ZnS crystal structure with the variable unit-cell. Note the index prefixes after PRIMVEC, CONVVEC, and PRIMCOORD keywords. It is possible to specify one or several scalar fields (both 2D and 3D) as an uniform mesh of values in the XSF formatted file. The mesh can be non-orthogonal. This scalar field meshes are called datagrids. Note: datagrids in XCrySDen are general grids !!! the top datagrid section is called BLOCK_DATAGRID and is sandwiched between BEGIN_BLOCK_DATAGRID_xD and END_BLOCK_DATAGRID_xD keywords, where x stands for the dimensionality of the grid. Currently 2D and 3D scalar grids are supported. there can be an arbitrary number of BLOCK_DATAGRID sections. there can be an arbitrary number of datagrids inside one BLOCK_DATAGRID section. All datagrids belonging to the same BLOCK_DATAGRID must have the dimensionality as defined by BEGIN_BLOCK_DATAGRID_xD keyword. These datagrids must also share the following properties: (i) they should span the same space (origin and the spanning vectors must be the same), and (ii) they should have the same number of data-points. 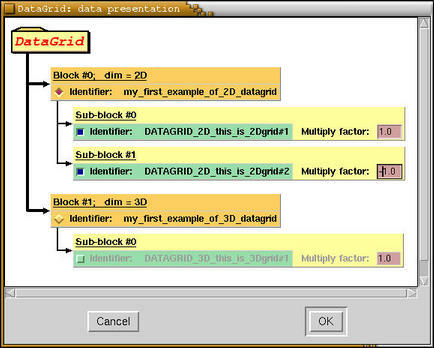 Each datagrid in a BLOCK_DATAGRID is sandwiched inside BEGIN_DATAGRID_xD_identifier and END_DATAGRID_xD keywords, where x stands for dimensionality of the grid and the identifier is used as an identifier of the datagrid. after the BEGIN_BLOCK_DATAGRID_xD keyword and before the first DATAGRID_xD_identifier keyword is a comment, which is used as an identifier for the BLOCK_DATAGRID. It must be a single word!!! Above specifications may sound very fuzzy, hence let us clarify this by looking at a very simple example. The description of all records follows after the example. Also take a look at schematic presentation of the structure of datagrids of below example. these lines specify second 2D datagrid in a block in totally analogous manner as the first 2D datagrid. Here is a scheme of the structure of datagrids of above example as displayed by XCrySDen program. 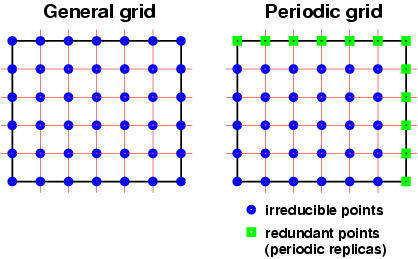 Here is a bandgrid example. The description of the records is below the example.